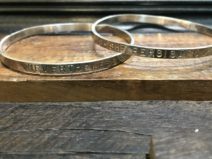 Learn the basics of hand stamping letters onto a strip of sterling silver, then practice basic torch/ soldering skills to turn your sterling strip into a bangle bracelet. THIS CLASS INVOLVES TORCHES. STUDENTS MUST FOLLOW THE HOT CLASS DRESS CODE AND SAFETY POLICY.